Home Alok Nath Indian Politics Social Media How is Indian Politics changing because of Social Media? How is Indian Politics changing because of Social Media? Very recently Sunanda Pushkar the wife of a very famous politician Mr Shashi Tharoor was found dead in her hotel room, the ugly spat on twitter between Sunanda and the Pakistani journalist Mehr Tarar may have been a primary reason for the death of a beautiful lady. Social Media is a two edged sword it can make you very popular but it can also affect your personal life if you leak it on Social Media. Indian politics was largely unaffected by Social Media until few years back when the main source of promotion was Print and Electronic media. Then the power of social media was first realized by Mr Narendra Modi the PM hopeful from BJP. Narendra Modi the BJPs brand ambassador was instrumental in creating the twitter handle and Facebook Fanpage. Then many other political leaders from Indian political parties started realizing that Social Media presence is very important, as its a sure shot way of connecting with the Indian youth. By the time others realized Narendra Modi had gone past everyone else, way too far ahead and everyone started thinking no one can beat him but then the most unexpected thing happened. The pioneer of India Against Corruption Mr. Arvind Kejriwal entered politics. He already had tremendous experience in Social Media with his non profit India Against corruption and with an ideology of corruption free India the youth of the country started relating themselves with it. The AAP (Aam Admi Party) used the Social Media in the most efficient, smart and effective way as no one could imagine. All they did was created a Fan page and started posting their ideology with some effective pictures. The youth of India which were already connected with Social Media and spend 50% of time on Facebook and 50% time on WhatsApp started liking and sharing the AAP posts resulting into instant publicity and AAPs posts started going viral. Mr Arvind Kejriwal discussed almost everything on social media including his illness one example was his tweet Running 102 fever since yesterday. Severe loose motions. Sad that I won't be able to attend office today. This level of openness made him very popular and there is a very popular saying in marketing which says "Any kind of publicity is good publicity" after all "जो दिखता है वही बिकता है". India's home minister said that Government is planning to monitor twitter and Facebook for possible misuse what is the real intent is not yet clear. The implications of social media are both good and bad and the way a political outfits use it can either make or break them today. One of the biggest strengths of Social Media is that it has an immediate impact on the masses and it keeps spreading like viral fever and if you constantly use it effectively it can certainly benefit you AAP is for sure a victorious case study. 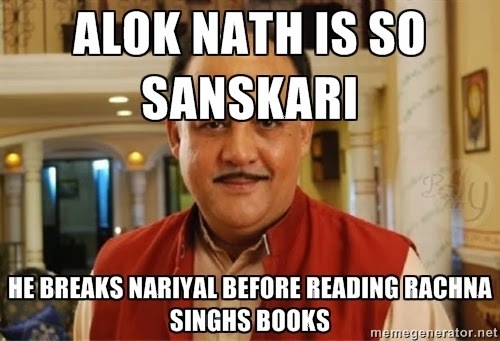 One of the biggest example of power of Social Media was our very own and dear yesteryear actor Alok Nath. He started trending on Twitter one fine day and for the next whole week Facebook, Twitter and WhatsApp was flooded with Alok Nath realted jokes. After 60 years of India's Independence the Indian politicians are for the first time forced to learn a new thing and that is to use Social Media. Social Media management is an art and only topics which connects with the masses or to which they can relates goes viral and for that you need to really have an ideology in your roots to spread, if you keep posting boring outdated stuff it can have very negative consequences resulting into very sparse fan following which may result in poor on line reputation. The outcome of 2014 elections has become even more interesting thanks to Social Media. Who wins we all don't know but whoever does not use Social Media effectively will not win for sure.